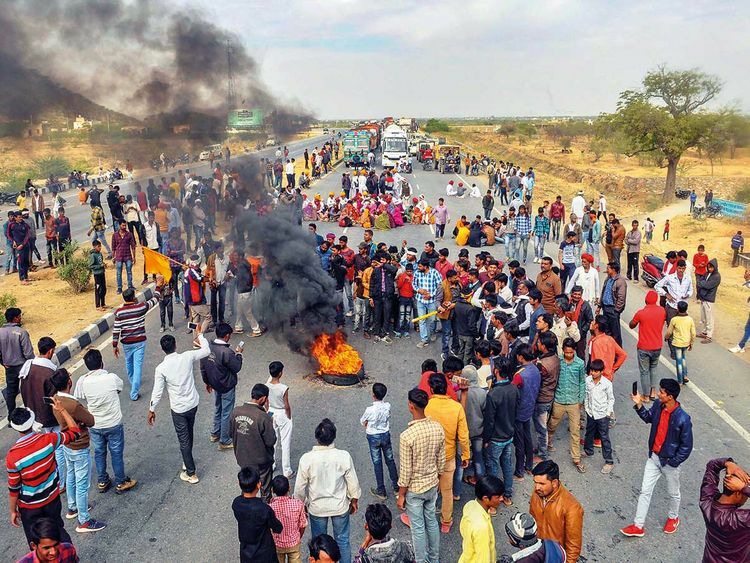 Jaipur: People from the Gujjar community blocked National Highway-11, which connects Jaipur to Agra, in Rajasthan’s Dausa district on Monday. It was the fourth day of their protest demanding 5 per cent reservation in government jobs and educational institutes. Their protest turned violent on Sunday when shots were fired and police vehicles were torched in Dholpur district, forcing authorities to impose prohibitory orders under CrPc section 144 in Dholpur and Karauli districts. It still remains in force in the areas. “NH-11 was blocked at Sikandara in Dausa. A state highway was blocked in Bundi district’s Nainwa on Sunday and Malarna road in Sawai Madhopur and Karauli-Hindaun road at Budla village in Karauli have also been blocked,” M L Lathar, director general of police - law and order, said. Dausa Superintendent of Police Prahlad Singh said vehicles heading towards the blockade on the national highway were diverted to alternative routes. “The traffic is being diverted and things are under control. The blockade is peaceful,” the SP said, adding that efforts were being made to clear the blockade. The North Western Railway said in a bulletin that four trains had to be diverted on Monday. “We will not move from the tracks if the announcement is not made. There is only one demand and that is 5 per cent reservation,” Bainsla’s son, Vijay Singh, said.